Coming soon to a XANT partner near you: all the necessary details about our technology in your local language and in your time zone! After building up a first series of reference projects from Vanuatu to Alaska, it is now time to bring XANT closer to its potential customers. Wind turbines are inevitably rooted locally, and they won’t go anywhere for the next 20 years. But before that, the on-site wind regime, regional regulatory framework for permitting and grid connection, and any government incentive (whether it is a tax reduction, grant money or a feed-in tariff) all come into play to build a successful project. XANT partners turn opportunities into profitable installations by applying their knowledge on all these aspects. Once the project is started they remain your local point of contact to address any concern you might have with the installation. 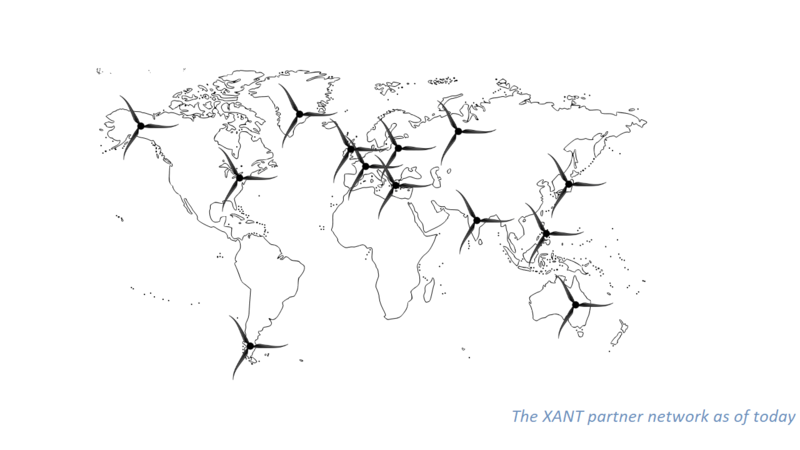 During installation and commissioning, the XANT staff will work together with your local XANT partner to get your turbine operational in the shortest time. Once in operation, your local XANT partner will take charge of the Operation and Maintenance of your wind turbine to keep it in excellent shape throughout its lifetime. We have carefully selected our distributors based on their track record in mid-sized wind project development. They know how to integrate the XANT wind turbines into micro-grids. They can find the best XANT product for your behind-the-meter application. Tilt-up or stand-alone tower, integrated energy storage, cold-or hot-climate package, concrete-less foundation…they will help you to make the best choice among the myriad of possibilities to get the best product for your project. We keep them posted on XANT’s technology development and assist them to help you. So contact us to find out who can help you reduce your electricity bill near you! If after reading this, you feel representing XANT in your region might be a good fit with your current activities do not hesitate to contact us. We are always happy to welcome enthusiastic partners in our network.